“I was really fit and used to go to the gym five times a week,” she said. After studying psychology at university in Glasgow, Leisa moved to London where she worked for three years helping people recover from brain injuries. Leisa returned to work in London soon after but kept picking up infections. “I came back home for what I thought would be another two weeks’ rest and I was housebound for six or seven months,” she said. Drained of energy, Leisa sought medical help from a variety of sources without success. “I kept going back to the doctors and they kept giving me antibiotics and painkillers. I didn’t know what was wrong with me,” she said. “I kept getting blood tests and everything was normal. I felt totally lost as if everybody was questioning me. I remember one day I could barely pick up a pan to boil an egg. “My home turned into my prison and I felt like I’d become a burden on my family and friends. I hated every second of every day as I felt so unwell. “I started to try lots of alternative therapies and spent lots of money trying anything I could.” Leisa ultimately turned to Mickel Therapy – a treatment developed in 1999 by Dr David Mickel, who lives in Elgin. It seeks to address problems with the hypothalamus gland in the brain. The gland normally regulates everything in the body but can become overactive, creating a wide range of symptoms. The therapy teaches clients to translate their symptoms back into primary emotions and take corrective action so the symptoms no long need to occur. Leisa said her body had been overworking chemically, leading to chronic fatigue. She admits the therapy might be difficult for some people to understand. “If you were to sit on a pin, your body would send you clear messages of pain,” she said. “You could think positively, tell someone you were in pain and you might even cry out. But until you listen and act to remove the pin, only then can your body get the message and stop sending the symptom. Leisa feels rejuvenated and has now trained so she can deliver the therapy to other people. Because it is a vocal therapy it can be done over the phone or through a webcam. Leisa already has clients in England, Sweden and America, as well as in Moray. More than 5,000 clients, many suffering from ME, chronic fatigue and fibromylagia – all caused by an overactive hypothalamus gland, have reported being returned to full health using the therapy, although more clinical studies are still needed. 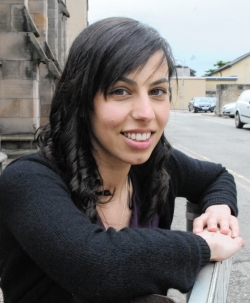 Leisa has also returned to work with Moray Council, where she is a part-time training facilitator in the field of autism. She also works with the Lifeskills organisation in Elgin helping people back to work. “I feel great now. I still have to be mindful of not making the same mistakes again and put the therapy into practice to keep me well,” she said. This entry was posted in General News and tagged article, leisa, newspaper, northern, scot, scott, zakeri. Bookmark the permalink.